Over 250 table soccer links! Tischfussball, Kicker, Futbolin, Pebolim, Tafelvoetbol, Bordfodbold, Baby-foot, Joggele, Stolni Nogomet Links!! Nike foosball commercial w/Kevin Garnett & Brandi Chastain! See: Nike Soccer Foosball Graphic T-shirts! Why we Net-foosers do what we do. It's short & to-the-point. June 2001 Tournament at Sharks! October, 2008: We recently got a note that Warrior Table Soccer is having some big tournaments coming up, including a $50,000 "Super Doubles" event in the Los Angeles area November 27-30 (see flyer 1, flyer 2), and a $20,000 Missouri State Championship November 14-16 in Clayton, MO (flyer). There's also an LA Foosclub warmup to the super doubles event November 7-9 (flyer). 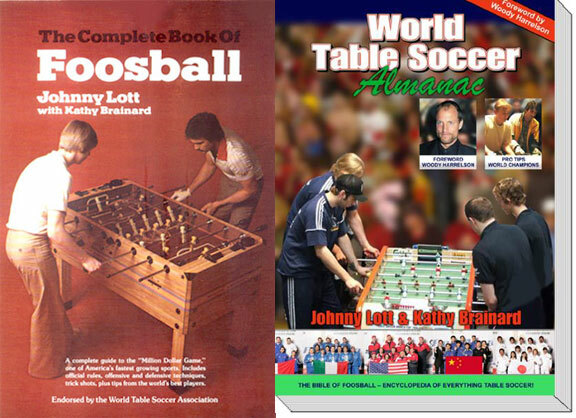 World champion legend Johnny Lott and Kathy Brainard have finally published their new definitive book on foosball, to follow up their 70's classic, the out-of-print "The Complete Book of Foosball" (which if you can even find it, will sell for hundreds of dollars). The new book is called the World Table Soccer ALMANAC, and it's a monstrous 708 pages! It has everything! Currently there's a limited-time offer for $10 discount on both the hardcover and softcover. Click here for information. World champion legend Johnny Lott and Kathy Brainard have just completed a new definitive book on foosball, to follow up their 70's classic, the out-of-print "The Complete Book of Foosball" (which if you can even find it, will sell for hundreds of dollars). The new book is called the World Table Soccer ALMANAC (Link), and right now, there is a very special eBay auction for signed and numbered collectors editions (Serial numbers #001 - #010). so don't miss your chance and bid now! August 10, 2006: Bulgarian Foosball: I've been informed that the Bulgarian Table Soccer federation has just been formed! Great to see foosball expanding everywhere! Their new website is www.bgtsf.org, and they even have an English-language forum. Good luck guys, and thanks for the note! August 2, 2006: Foosball DVD released: FOOS - Be The Greatest - The History of American Foosball DVD has just been released! More info at foosmovie.com. Take a look! July 27, 2005: Online foosball updated, join the betatest: The Miniball online foosball game has been upgraded to Miniball2. Miniball2 has just opened a beta test this week, and it goes until August 2005, so be sure to check out their site here. International league play will soon follow thereafter. Feb 4, 2005: Ashlee Simpson Foosball-- Teen People Magazine is having a Tsunami relief auction for UNICEF, and one of the items up for bid is Ashlee Simpson's personal (and autographed) foosball table, read more about the fund raiser here. It's a Carrom Graphite Signature table, and the eBay listing (closing Feb 14) is here. Oh, and you get her Marc Jacob boots too. Feb 5, 2005: TGSNT Flash Foosball-- The Greatest Story Never Told site has a flash caveman foosball game, that's a lot like pong, so you can pong away here. I'll just keel over if a tournament pro programs a flash foos game some day. . .
Sep 12, 2004: Foosball robot being developed in Germany at Freiburg University. Really. It's said to beat 85% of all casual players, although a German league player beat it 10 games to 1. Here's one article. The original article was from the New Scientist. Sep 9, 2004: I just got word of an interesting Foosball Movie Documentary, and it actually looks very well done! You can see the trailer and decide for yourself: hi res (12M), low res (625k).